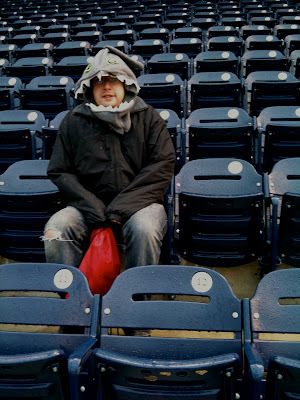 Congratulations (Shark-less) Washington Nationals on your first win of the 2011 season! Despite a rain delay to start the game and a hail delay in the middle of the game, the Nationals pulled out a convincing 6-3 victory over the Atlanta Braves. The game had it's ups and downs (biggest down was that Roger Bernadina didn't play) but a victory is a victory, and the Nationals have a .500 win record for the first time in almost a year. Shark rival RicK AnKiel hit his first home run of the season (although he suspiciously pulled on his red face mask again before the at bat and rounded those bases with shark-like speeds....) and had a suicide squeeze for 3 RBIs in the game. Jayson Werth, Ryan Zimmerman, and Rhino Ramos contributed to the victory (8 for 12, 3 R, 1 RBI)! Ian Desmond and Adam LaRoche did not (0 for 10, 12 LOB!?!?!). It's excusable for Desmond, as he is still recovering from the shock of Bernadina's demotion. But LaRoche, come on. Larry King was at the game today. He was there to interview Bernadina and threw an awful fit when they told him that the shark was demoted. The Nationals compromised by letting him throw the first pitch and giving him a dope leather jacket. During the second weather delay, a team of renegade Shark fans ran out on the field and started constructing what appeared to be the base of a large shark tank over the infield. While they were eventually chased off the field, their structure remained until the grounds crew could clean it up after the rain. When asked about it, the leader of the group, Boomer Whiting said, "I will do everything in my power to get the Shark back on the field...and I have all sorts of power." Whiting then vanished in a cloud of smoke. Many people left when the inclement weather returned, but real Shark fans were not deterred by a little rain or sleet...or hail. I believe that BOOMER WHITING will be the Robin to the Shark's Batman. The grounds crew line was hilarious. I'm telling you. Every morning I can check this site out for a laugh.